Joe Satriani has just confirmed the dynamic ground breaking hard rock outfit Living Colour to the bill supporting the West Coast leg of his upcoming U.S. tour. Living Colour will join the world renowned guitarist when he hits Seattle, WA on October 22nd and will continue through Salem and Paso Robles before winding up on October 26th in Satriani’s home base, in the Bay Area, with a show at the Fox Theater in Oakland. The U.S. tour launches on August 29th in San Diego with Steve Morse as support on the first leg. Joining Satriani on the road are veteran band mate Mike Keneally (Frank Zappa, Steve Vai) on keyboards, along with an entirely new rhythm-section, featuring bassist Bryan Beller (Dethklok, Dweezil Zappa) and drummer Marco Minnemann (Adrian Belew, Steve Wilson). 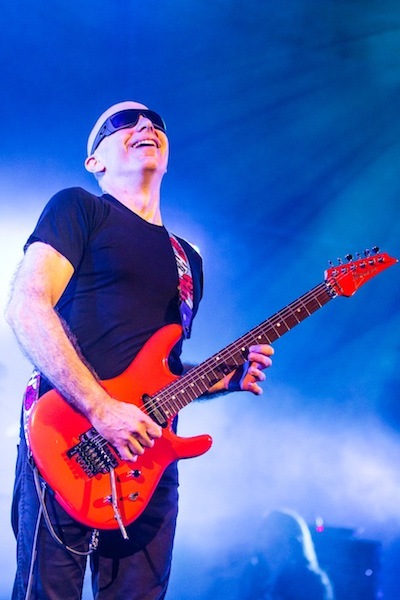 Satriani has just concluded his hugely successful two-month European tour, the critical praise is overwhelming. Hitting seventeen countries in all, the tour has played to sold-out venues throughout the continent. It was also recently announced that Satriani will be honored to perform the National Anthem at this year’s Red Bull U.S. Grand Prix at Mazda Raceway Laguna Seca. The multi-platinum guitarist is set to serenade the grid this year as he performs the Star-Spangled Banner at the Red Bull U.S. Grand Prix on Sunday, July 21. Satriani will perform from the track just prior to the three-day event’s premier contest, the MotoGP™ World Championship race. For more information, please visit satriani.com. I’ll bet there’s as many women at a Satriani show as there is at a Rush show, next to none. Love his guitar work though. He just lays down these great groves, and shreds over them. There seems to be conflicting info on who will be his drummer. Above he states it’s drummer Marco Minnemann, but he has also said that Vinnie Colaiuta from Zappa is the guy. Anyone know who’s playing drums for sure? Also, Steve Morse wouldn’t be a bad guest guitarist on TMS. Dunno who the drummer is t. But if you give it enough time I bet you it will eventually be Mike Portnoy. “t”, there usually are women at Satriani shows, though admittedly they are not the majority of those in attendance. I think Rush’s demographic has changed a bit, there’s been a healthy contingent of female fans at the last several Rush shows I’ve been to. My last time in the row in front of us were a bunch together (meaning they didn’t appear to be there only because of their boyfriends/husbands), and they were really into it. And they were young, and attractive! At a RUSH show! Could it be? Maybe Rush really is cool now!?!? !